Both are equally talented but difference is in nature and temperament . Tendulkar seems to have been a self centred person who deliberately slowed down his style of batting in order to play longer innings in order to achieve milestones in cricket . On the other hand Kohli has not slowed down his style of batting and still plays strokeplay in the same manner or even better than when he began to play cricket . 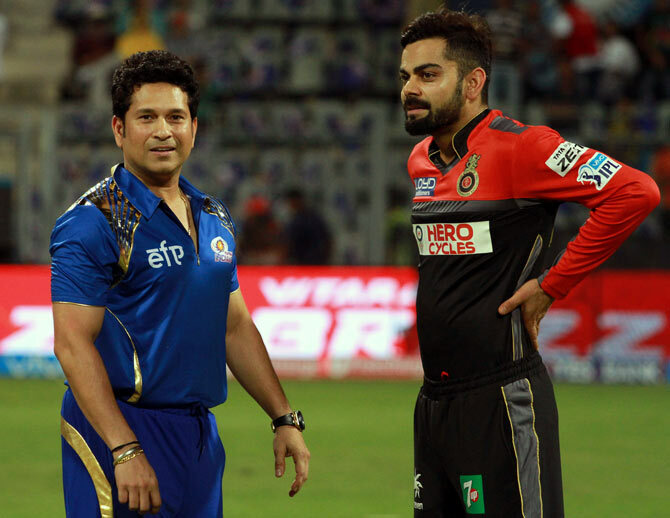 In chases in limited overs cricket , there is no doubt that Tendulkar used to come under mental pressure while chasing and that he was not as great a chaser as Kohli . Kohli on the other hand seems to revel under chasing pressure and it brings out the best in him . This comparison is however tilted heavily in side of limited overs cricket as strokeplay is more needed here . In test cricket Tendulkar is probably ahead of Kohli . If the media had not supported Sachin in his initial days he would have been just another cricketer. The media glorified him and that boasted his morale plus the innocence of a child on his face played a major part in his career. No doubt he was a great player but some of the above played catalyst in shaping him. Kohli has taken the fear of cricket. He has made katchara out of centuries. Even WI didn't play like this in their golden era. His style doesn't suit the indian temperament which is to be defensive all the time. Kohli is ahead of Sachin in LOIS. Sachin did not play so many match winning innings as Kohli has done already. In Tests however, Sachin is ahead of Kohli by some margin. But Kohli's has started bridging that gap and if he continues, he can be ahead of Sachin in this format as well. I dont hate Sachin Tendulkar but I hate the sycophancy and constant deification and glorification. Even if he farts, its like ooh what a fragrance! I also dont care for Kohli.... He is good at his game. Fine. I mean, after a point, the reality is that Sachin was good at cricket and was lucky enough to get a break into Indian team and the rest is history. I personally dont care who was better or whatever. There is a whole section of the cricket loving folks who obsess over statistics and all such banal and useless facts and trivia.